After my previous post for making sourdough starter, I thought I would give you my favorite thing to make with the starter. These English muffins are so good and just have a couple of ingredients. Have you looked at the ingredients on store bought muffins? Well, I like my ingredients better: flour, water or milk, raw honey, sea salt and baking soda. Can’t get much more basic than that! I usually make a double batch, slice them, and put in the freezer. Place the ½ cup sourdough starter into a medium size bowl. Add the 1 cup of liquid. Stir to combine the starter and liquid. Add 2 cups flour and optional add-ins. Stir well to combine. 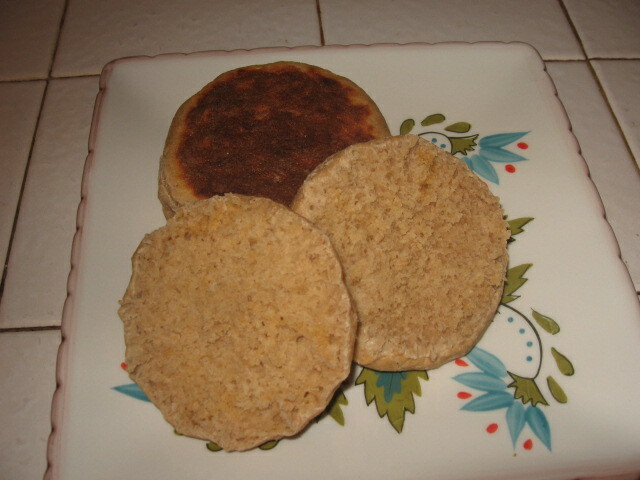 *Note: I have found that the English muffins are much more tender on the inside when I have used kefir. If using water, you may need to add a bit more flour initially for easier kneading. If using yogurt, you may need to dilute it a little if it is really thick. On top of your soaked dough, sprinkle the salt, baking soda, and honey. Use a wooden spoon to push/cut/stir in your newly added ingredients. Turn out onto a lightly floured OR oiled surface to knead the added ingredients just enough to blend. Do not over knead. If sticky, just put some oil on your hands. Don’t add too much flour. Preheat a griddle or skillet to medium. You don’t want it too hot or the outsides will get too dark and the inside won’t be cooked. Carefully transfer the muffins onto your pan. Cook for about 5 – 7 mins on each side. They will start to rise a little so turn carefully so you don’t deflate them. Cook another 5 mins or so. Move to a cooling rack. They will keep about 5 days and freeze great!